This brings up the Do not disturb options screen. From here we have the ability to set six options. These six options are separated into two categories: Timed or Scheduled. Here is a brief explanation of what each of the six options does. Until I turn it off is an indefinite do not disturb. 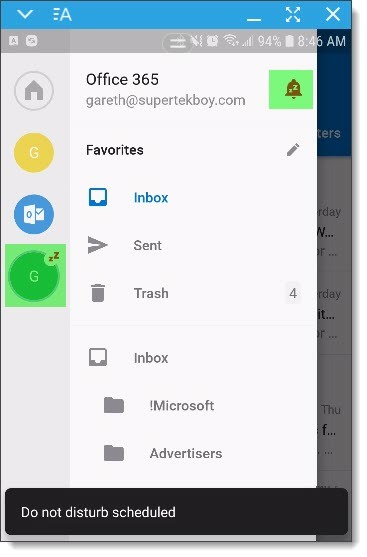 All notifications from the Outlook client are silenced until you chose otherwise. For one hour silences Outlook for one hour. The time to the right of the selection lets you know when do not disturb will expire. Until tomorrow keeps do not disturb in place until 8 am the following day. During events allows you to silence Outlook notification during any busy time on your calendar. This can include both appointments and meetings. This is particularly useful if you want to automatically quiet your email during meetings. During work hours allows you to silence Outlook notifications during work hours. During weekends silences Outlook notifications from Friday 5 pm to Monday 8 am. Pro Tip: Only one option under Timed can be active at any one time. However, all three of the Scheduled options can be active simultaneously. Also, any of the timed options can be used in conjunction with any or all of the scheduled options. Following our example, let’s set our work account to be silent during the weekends. Select During Weekends and click the Done ( ) button in the top right. Do Not Disturb is now set. 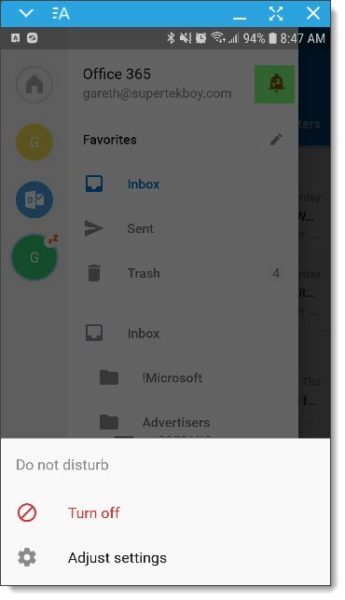 When the Do Not Disturb enters its scheduled time the icon will become red ( ) and it will automatically silence all notifications from that email account. 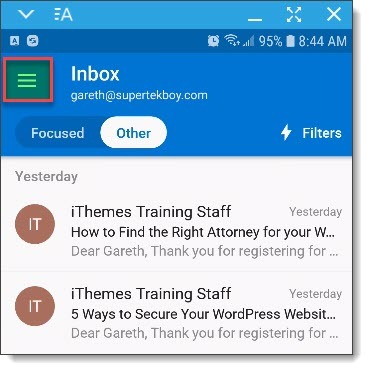 The Zz’s superimposed over the email icon also identifies which accounts currently have an active do not disturb in place. From the screenshot below we can see only one of three email accounts are currently silenced. 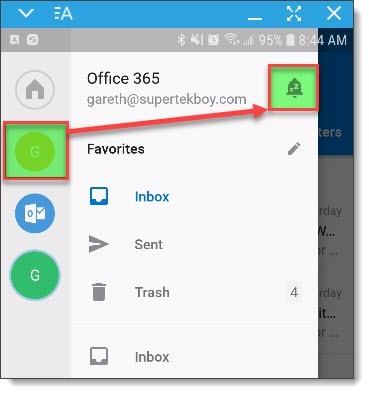 Continuing with our example, we would then select our personal email account, select the Do Not Disturb icon and, pick the During Work Hours selection. This would silence our personal email during work hours and our work email during weekends. To cancel or modify a do not disturb click the Do Not Disturb icon ( ). 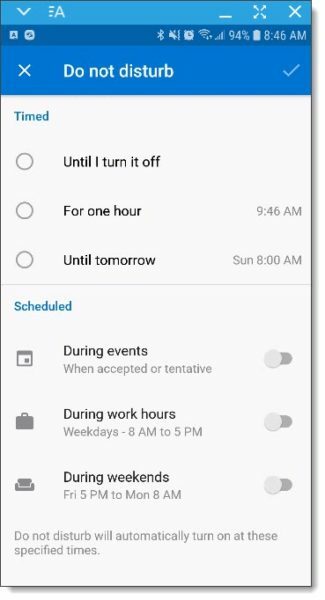 This will bring up a menu where you can either disable or modify the do not disturb by selecting Turn off, or, Adjust Settings respectively. Also, the two options: silence when in work on a weekdays, and silence during the weekend, do not make sense. It should either protect work from personal messages, or protected private life from work emails, or give flexibility. Today, it gives nothing from the above. Uhm fantastic. But what if your working hours are not 8 to 5 but 9.30 to 6pm? What ‘TV’ and ‘Joe’ said, Incredible ridiculous that there no way to automatically set for afterwork hours. I don’t see this option at all. Using the latest version for Android on an Office 365 domain. No bell with line through it icon at all. Plus, Outlook is an INCREDIBLE battery drain. It uses over 2% an hour by itself & there’s not way to prevent constant polling. Overall, it’s a really bad app but is the only one I can find that supports modern authentication. The do not disturb -mode is not even available to ios. I cannot see it neither on my ipad or iphone with newest outlook app. I thought it was already out? Couldn’t agree more about the fact that I can’t choose my own schedule for do not disturb! Can you let Microsoft know? 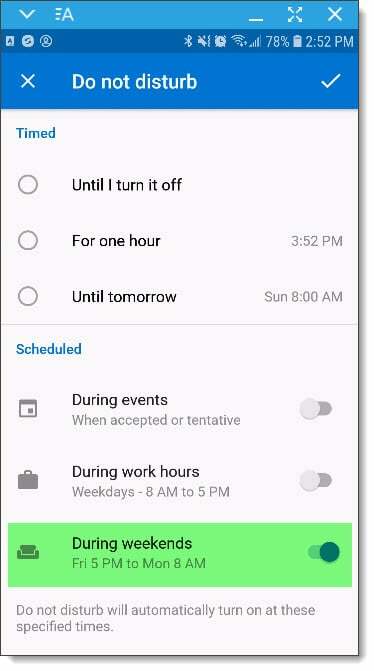 “Do not disturb” during work hours button but nothing for after work hours????????? And no custom hours setting. This needs a lot of work still. Not sure why I need the ‘do not disturb’ mode during work hours but can’t enable it after work hours? It’s seems more accurate to use this mode after working hours so I don’t keep receiving mails from work. So there’s no option to set a custom schedule? That seems like a big oversight. I want Do Not Disturb on my work acct from 5pm to 8am. Can’t believe they thought to add ‘During work hours’ but overlooked ‘Not at work’. Sure I can set ‘Until tomorrow’ but I should have to do it every day. Work is not my life. I agree this is a basic feature that must be put in the next release. Thnx fot the article. Can’t find the option. I’m using iPhone, is that the problem? It is not available on iOS. And yes, iOS is a huge problem. Move to Android. This is quite a silly reply. Move to Android? That’s like telling your users to “Move to Linux” because they don’t like a feature of Windows Explorer.